Can you manage your way through the perils of playing with tiny little colored squares? This is the Pixel Slam Jam! Relic Castle's pixel contest that happens every once in a while! Welcome to the newest Pixel Slam Jam! This time we've got our first theme around trainer battle sprites! Show us your design for an all new trainer class that specializes not in a certain type of pokemon, but in a certain type of battle mode! If you came to the Slam Jam looking for your fakemon fix, you might check out this thread; Relic Staff aren't involved but it is also starting today! In the main series games, Double Battlers are often made up of two trainers by combining or altering existing trainer classes. The Pixel Slam Jam is a friendly competitive event where participants create pixel art based on a theme. Submissions can be spliced sprites or scratch work, and do not have to fit the standards/limitations of Essentials or RMXP. If you have made something prior that happens to fit the current theme please do not submit it here; our goal with this event is to provide a fun exercise for our members. There is a special time window where submissions are accepted, and when that ends the judges take a short time after to collectively decide who to award and write up any critiques. ›Design a new trainer class that specializes in a special battle mode. ›Post your pixel creation in this thread, and include your design thoughts with it! ›Mention in your post if you'd like to receive critique during the Award Round. ›Check back here after the conclusion to see who earned themselves a Pixel Slam Jam Badge! ›No submitting anything that was completed prior to the event. ›Do not critique in this thread.Got questions or comments? Post in the Pixel Slam Jam Discussion thread. Inspiration: It was mostly out of nowhere honestly, I was in class and suddenly "Wouldnt a circus beast tamer be perfect type for a rotation battle specialist? ", who knows where that came from, my only experience with circus beast tamer is Regina Berry from the Ace Attorney games, and this trainer doesnt look like her at all. For some reason in my mind, the beast tamer would perfectly switch pokemons in order to screw you, like it would foreseen if you would switch your pokemon due to its perfomance experience, and then it would just change it to the most advantageous match up...for her I mean, you are going to lose lol. Her clothes dont look all that beast tamer looking, somehow I just wanted to go for a more clowny look, hence the assimetry in all her clothes. And welp, I went almost full ribbon in this, I dont think her dress its physically possible without some ribbon stitching. The purple stuff in her face its my try on doing a star shaped make up, I wanted to do it on her cheek instead of her eyes. 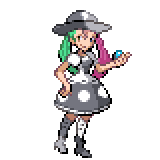 And welp, trainer splicing is hard, Im sure I effed up with the legs, the left twintail, choosing the clown arm which its probably too big, and the fact that she isnt looking at you (she is probably shy! or its just checking the balance in the pokeball! ), but I think the overall result is decent. But if you like her that much, you are free to take her and put her ins your fan game or do some edits, as long as you credit me. Ispiration: I want cassinos back in pokémon, roulettes roll, rotation battles also roll... and that's it. Originaly they would be roullete ladies but i added a crown because they reminded me of the Queen of Hearts. I made two variation just like the swimmers in S/M, the only difference is the colors and changed the cassino tokens to coins. I would like to recive a critique. They are the masters of the cassino, it is not wise to challenge them. Their teams are very based on luck, they do not play to lose. If you defeat one of them you will be rewarded a generous amount of game coins. 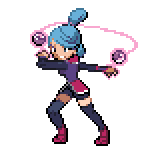 Inspiration: Because the only inverse battler that we've seen in the games so far has been a psychic, and inverse battling seems to fit psychics well, I wanted to give this trainer that kind of vibe, while also not making them too similar to psychics. 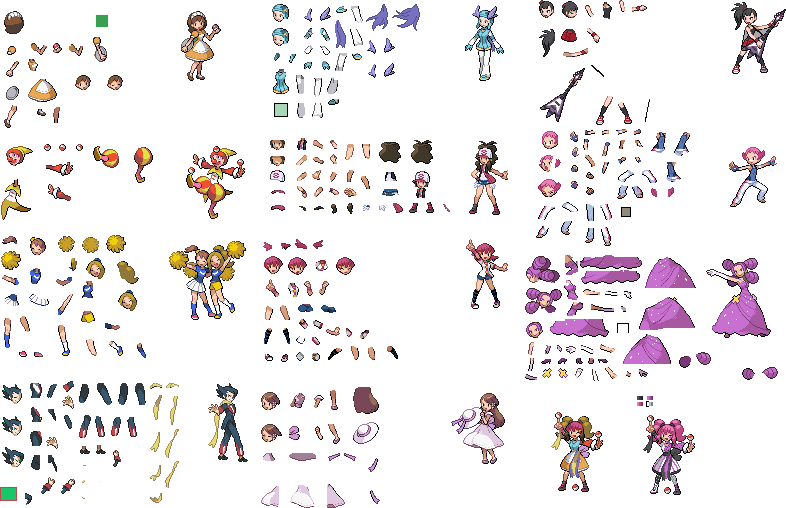 I mainly just looked took bits and pieces from other trainer sprites (mainly psychics and ace trainers, because they fit the theme I wanted) and messed around with them until it looked good. Inspiration: Honestly, I didn't have a basic design or inspiration in mind. Figured I would make an Inverse battler, given how it's outright terrible how the already underutilized battle mode was unceremoniously removed in Sun and Moon. But yeah, my main thing design-wise was that I wanted the colors to be inverses of one another. Black and White is the easiest color pairing for that, but I wanted something different for the hair. Out of all of the inverse color pairings, pink and green sounded the most interesting, so I incorperated them into the hair colors. Thought I'd be boring and go for a double battle. Dance Partners - Double Battlers. Inspiration - It seems like a fairly obvious concept. 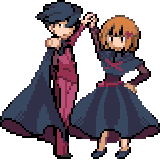 I liked the idea that at a dance the humans would dance together while the Pokémon would battle together. I was originally going for a formal sort of dance and this was the result of a fair amount of splicing. No idea what kind of dance they might be in. They seem like they're having fun at least. Hopefully their coordination in battle is sharp as well. Hi everyone, another Pixel Slam Jam has come to a close! There was an unusually high number of winners this round due the the small number of entries all being so high quality, so below you'll find not only critiques but a note about each sprite. Thank you all for submitting and congratulations to the winners! Absolutely fabulous sprite in both design and execution. Thanks for making it public! The two different colored designs are a really nice touch! The colors might be a bit on the harsh side, but that actually seems to fit with the character. When it comes to shape, there is a bit of a strap(?) on the gloves that could use something; especially the one on the left is very stiff and almost resembles another playing card sticking out. This is a fantastic first trainer sprite. Since it looks good, how about a critique on design choice? The sprite easilly looks like the Ace/Psychic hybrid you were going for, but to more imply the Inverse nature of this trainer, maybe using some inverse colors would make it really obvious. A memorable design that would look great in any game as an official trainer! A really creative motif for double battlers; especially considering how many official trainer classes there are already, it is very cool to see a whole new idea.